Learn how to get Kim Kardashian hair by silking and curling it in this Howcast hair tutorial, the first of a two-part series with Jacqueline Bush. So now I&apos;m going to show you how to get hair like Kim Kardarshian. The first thing I&apos;m gonna do is run a little bit of heat protector product through her hair. The reason I&apos;m doing that is because Monica&apos;s hair is fine, curly, and blonde; and curly hair in general tends to be drier than straight hair- so it needs that extra protection. I&apos;m just getting a little product through the ends. I&apos;m gonna start at the front. The first thing I&apos;m gonna do is I&apos;m going to just pull the very front. The reason why I&apos;m leaving this out is just because it&apos;s shorter and when you curl the hair this is the intergral part of blending, so I&apos;m just gonna leave that until the end. I&apos;m going to take my first section of hair - which what I did, to make this the quick way, is I took from the top of her hair, down to the very base of her hair. I took the whole section and it&apos;s pretty skinny. The reason why I can do this on her is because her hair is so fine that it&apos;s not going to be too much iron, but if you have alot thicker hair than Monica does, you would section that off in half, or less than that; but for her, she doesn&apos;t have enough in this particular section that it&apos;s really going to matter. So I&apos;m going to take that section and take a one-inch curling iron - the key to this part of it is using the right kind of iron. If you use and iron that doesn&apos;t get as hot, that&apos;s what&apos;s going to make the curl not hold or get the same effect. I&apos;m going to take the section of hair I have and I&apos;m going to silk the hair; which is just running the iron through - see how my tongs aren&apos;t quite closed. Heating up the hair, smoothing it out - or silking it - I&apos;m just going to make that area of the hair receptive to the curl. So I&apos;m going to take that hair and wrap it around the iron. Now for me, I keep opening and closing the iron in a very small way - the reason I do that is because it keeps the hair from getting crimped. So now we have our curl. It looked a little short, right? So just very gently pull down on it a little - just to make the curl a little bit looser. Now the reason I&apos;m using a Vonage iron as opposed to a larger iron - like this - is because this is a harder iron to keep the curl in; even for somebody with the length of hair like hers. 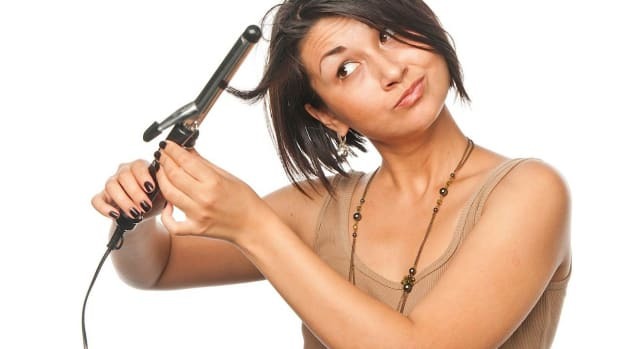 Whereas an iron like this, you can get a smaller curl, a larger curl, you can get the amount of curl you need and all you have to do if you want it to be larger is pull it out a little bit - you could use it alot more than you could use those really big curling irons. So now she has more hair back here as I&apos;m sectioning that off a little more - I&apos;m going to do the same thing. Gonna silk first. The way I showed you a moment ago, as I put the hair in the iron I curl from the mid-shaft and kept working my iron around. This is really difficult to do at home - so what I&apos;m going to show is the easy, user-friendly way. We are going to silk the hair and starting at the bottom of the hair - we could leave the ends out a little bit - you&apos;re just gonna curl up. Now when I get to the top, you still want to open and close the tongs a little bit. Otherwise, you&apos;re going to dud that hair. I&apos;m going to have to keep holding it here because you have to remember that the section is quite large so you want to make sure that the whole section gets heated. Still holding the iron, I&apos;m going to do the same thing on the top section. I&apos;m going to silk it twice just to make sure the whole hair is heated up. Take the iron down and work up the hair. Notice I&apos;m not very particular about going all the way up to the roots because the Kardashians like it very smooth on top of their head; they don&apos;t like it curled straight from the root. Keep working the iron around and what I&apos;m doing right now is feeling the top, asking myself if it&apos;s hot enough. Feels pretty good - gonna let that fall out. We&apos;re going to keep working like this all the way around the head.